What they say about us? Asian investment in CEE – will the sun from the east continue to rise? Money from East Asia burst on to the CEE scene in 2016-17, mainly via large industrial sector portfolio deals. The industrial sector received the majority of 2018’s flow as well, though diversification via larger single asset deals is beginning to occur. Asian investors appear to need liquidity: looking by CEE-6 destination, Poland presently dominates. The biggest deal in 2018 with an Asian investor was the purchase of a Prologis industrial portfolio located in Poland and Hungary by Mapletree Singapore. The value of the deal was reported at EUR 335 million. 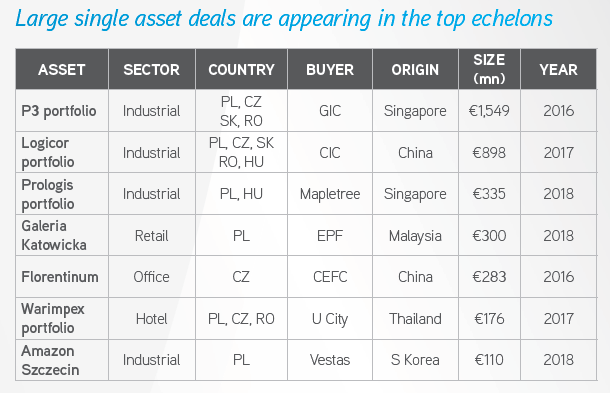 The below table presents top deals completed by East Asian investors in the period of 2016 – 2018 in the CEE-6. Will the sun from the east continue to rise? Investors from Malaysia, South Korea and the Philippines were new buyers in 2018. Singapore remains a prime source of capital into the region, perhaps explained by the city state’s high GDP per capita and high valuation of local real estate per capita. Chinese flow diminished to just EUR 60mn in 2018, due to capital flow restrictions. Data aggregator RC Analytics pointed out in a report that cross-border commercial real estate transaction flow out of Greater China to the rest of the world declined -60% in 2018. East Asian inflow amounted to 9% of the CEE-6 investment pie last year. From what other countries might capital come in the future? Japan, Taiwan and South Korea’s GDP per capita levels are similar to Western European sources of capital for CEE. The sheer size of the economies and high total value of commercial real estate points to a local investor base with long experience of cycles and investing in faster-growing markets. Prime commercial real estate yields tend to be higher in CEE than in East Asia. Lower prime yield premiums (real estate yield minus funding rate) in East Asia, certainly comparing the office sectors, should encourage locally-based investors to look at higher yield-premium destinations such as the CEE markets. We believe a moderate EUR appreciation versus local Asian currencies will continue its recent trend in 2019, aiding returns. Infographics – Asian Investment in CEE – The Rising Sun? Colliers International (NASDAQ, TSX: CIGI) is a leading global real estate services and investment management company. With operations in 68 countries, our 14,000 enterprising people work collaboratively to provide expert advice and services to maximize the value of property for real estate occupiers, owners and investors. For more than 20 years, our experienced leadership team, owning more than 40% of our equity, have delivered industry-leading investment returns for shareholders. In 2018, corporate revenues were $2.8 billion ($3.3 billion including affiliates), with more than $26 billion of assets under management. Learn more about how we accelerate success at corporate.colliers.com, Twitter @Colliers or LinkedIn.